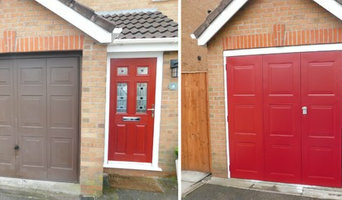 ProTec Doors is a staffordshire based company that deals with residential garage doors and industrial doors. 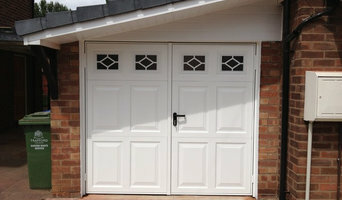 Avemoor garage doors are leading suppliers and manufactures of garage doors across the North West of England. We pride ourselves in creating curb appeal to your home with a range of bespoke fitted garage doors. Our product list includes Up & Over garage doors, Personnel doors and door accessories. We have more than 20 different designs made from steel and GRP, which we produce in a range of colours and with a variety of window options to enhance the look of your garage door. Our doors are fitted by industry professionals with over 25 years experience. If you're looking for a new and completely unique garage door for your home, speak to the Avemoor team today. CBL Garage Doors Ltd are a professional installer of garage doors in Greater Manchester. CBL Garage Doors have a range of diverse styles for clients to choose from. Dimension Garage Doors have over 20 years' experience in supplying and installing Garage doors throughout North-West England. Here at 24/7 Doors & Shutters Ltd we offer a wide range of door and entrance products to protect your business, allow access control and to make your property look great. Highly experienced we have worked alongside businesses throughout Greater Manchester and have developed an excellent reputation for the quality of our products and installation services. Our products: Steel personnel doors Sectional doors Roller doors / shutters Aluminium glass doors Plate glass doors Garage doors Electric & manual industrial doors A bespoke service tailored to you Contact 24/7 Doors & Shutters Ltd for your free consultation, we are more than happy to discuss the requirements of your business and suggest a door system to perfectly match your needs. Our expert installers will cause a minimum of disruption to your business and all of our door installations carry a comprehensive 12 month warranty for your peace of mind. Established in 1998 we are the longest serving provider of Electric Gates & Automatic Gates in Huddersfield & surrounding areas. We provide electric sliding gates, automatic gates, security bollards, CCTV & Video Entry. All items are manufactured in-house by our company, and are made using the highest quality materials. Most items manufactured are given a primer and top coat finish which will provide long lasting protection; we are also able to offer other finishes such as shot blast and galvanising. We serve both domestic and commercial markets in the following areas: Huddersfield, Holmfirth, Halifax, Wakefield, Brighouse, Elland, Golcar, Honley, Slaithwaite, New Mill. North-West Leading Double Glazing Specialists With over 20+ years of experience within the Glazing Industry we pride ourselves not only on using the Best products available but also setting a high standard of Workmanship and Aftercare. What do I need to consider when choosing garage doors? While it’s easy to think about the aesthetic aspect of your garage doors, you should also consider the functionality, too. If you’re going to be using your garage a lot, you’ll need doors that can handle the consistent opening and closing. A great option for this is roller garage doors which work like roller blinds and are much easier to open and close than up and over garage doors. If you want electric garage doors that open and close on their own by way of a remote, then roller and sectional garage doors are the best options. They are also much more secure if security is a concern for you. Think about how much space you need in your garage – if you want to utilise every nook and cranny then sectional garage doors, as well as roller, are very compact, and side hinged garage doors will give you more room at the very front of your garage (as the doors will be stored away at the sides when open). For the traditional look, wooden garage doors are usually the way to go, especially if you have other wooden elements to your house exterior. Try side hinged, timber garage doors with glazed windows for a classic, stable or carriage style look. If you’d prefer the easier roller garage doors, then you will have to stick with steel or aluminium, which will be great for insulation, and also means you can choose any colour for the coating. Sleek black roller doors can look minimalist and simple if you want an un-fussy feel. Whether you are decided on a style and material or not, talking to a professional from a New Mills, Derbyshire garage door company or garage builders is always advisable because they will know more about the functionality, prices, durability and installation process than anyone else. You may find that you can find a garage doors repairer or installer through another professional, such as a building contractor or architect. Here are some related professionals and vendors to complement the work of garage doors: Cladding & Exterior Contractors, Doors, Home Builders, Design & Build, Artists & Artisans. 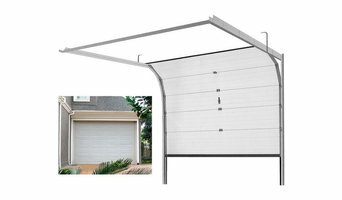 What is your experience in garage door designing, manufacturing or installing? How long has your garage door company been operating? Are you garage builders or do you only manufacture garage doors? Do you offer bespoke garage doors? Which garage doors are best for my garage/garage design? Which garage door material is best? Will it provide good insulation? Will it be secure? How much do your garage doors cost? Will there be an additional installation fee? Do you offer garage door repairs? Can you give me references from previous clients? When will you be able to carry out the garage doors installation? Who will be working on this job? Do I need to provide you with anything additional? Find garage door professionals on Houzz. Narrow your search for a New Mills, Derbyshire garage door company or garage builders by entering your nearest city or postcode. Look at portfolio and product photos, and read reviews to find the best garage door professional for your home.